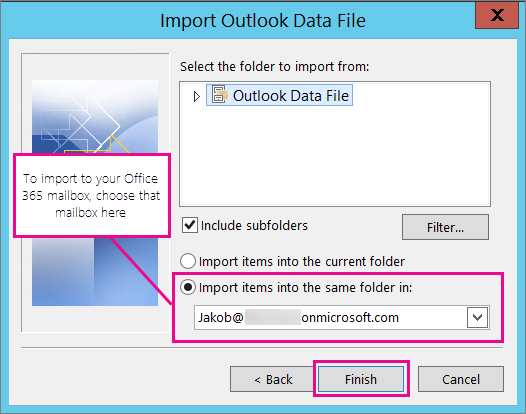 These instructions assume you've already exported your Outlook email, contacts, and calendar from another instance of Outlook, and now you want to import them to Outlook. If you're importing your .pst file to your Office 365 mailbox, you may see a message that it's trying to connect with Office 365. This happens when the Internet connection is interrupted, even for a moment. Once your Internet connection is re-established, Outlook will continue importing the .pst file. When Outlook exports emails to a .pst file, it includes any attachments. So, when you import a .pst file, you'll see your attachments. 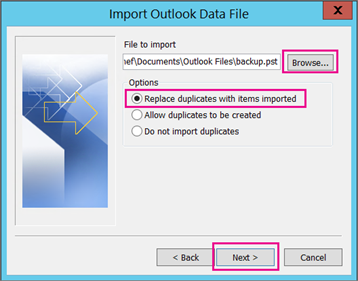 Outlook does not export meta-data such as folder properties ( views, permissions, and AutoArchive settings); message rules; and blocked senders lists. So, they won't be imported, either. 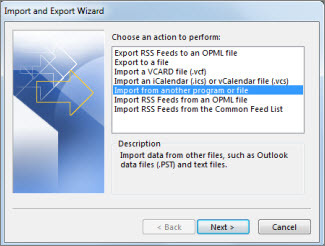 When Outlook exports email, contacts, and calendar info to a .pst, it makes a copy of the information. Nothing is deleted from Outlook. You'll still see and have access to your email, contacts, and calendar in Outlook. 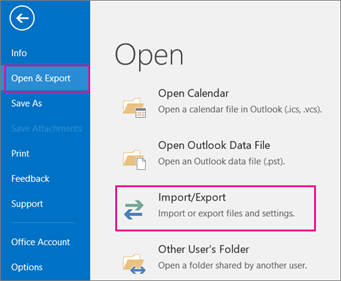 See Fix problems importing an Outlook .pst file for a list of common issues and solutions.